I was preparing for a workshop I’m delivering tomorrow. So I prepared myself and got quite a shock. OK. So I’ve always known my forename was drawn from the Roman God of war Mars and means ‘Warlike’. But I’d never ever researched my surname. Continuing the warlike strand the Germanic meaning of Gorman is Spear or Protection. Some would say this hideously aggressive combination reflects quite a lot of my personality. But I’m of Irish, not Germanic, descent and in Gaelic Gorman means little blue eyed one. Awwww. As I was about to sign off the Urban Dictionary caught the corner of my eye. “There’s a definition of Gorman in Urban Dictionary?” I mused. Let’s start with the main entry. A shyster. It does. The coolest man alive. I’ll settle for that. Where next I wondered? This surely must be the Gorman’s from Aberdeen definition (but it could be the alternative Irish definition I suppose). It’s getting worse. An inability to civily take a poo? Or to behave appropriately in restaurants. Given that all three of my kids do or have this is a major worry. The next one just makes me sad. But the following definition is definitely appropriate for the golf course. I’ll save the best for last because my dear departed mother in law would have chuckled at this. Turns out she was a true Gorman. Toby Jones saves his best for the small screen. Absolutely Marvellous. Marvellous is such a small movie in scope and ambition that it shouldn’t really register. It was made for UK TV and not overly hyped, yet it turns out to be a career defining work for an actor that has already had all manner of praise heaped on him for his role in Infamous and his many franchise movie roles (Potter, Hunger Games and The Muppets.). Like his contemporary Michael Sheen (Cloughie in The Damned United and David Frost in Frost/Nixon) he is adept at playing performances that impersonate the stars (Truman Capote in Infamous). Only this time the star is not really anyone outside of Stoke has ever heard of. He plays, Neil (Nello) Baldwin, a small guy with learning difficulties who has no fear of the conventions of life because the fear button in his brain is switched off. The result is an outrageous journey of hope over fear, joy over sadness and opportunity over failure. A clown. Stoke City’s kit manager. University of Keele doer. Crazy jobs each and all. And all brought to life by this amazing man’s unique personality. Three times I wept. It’s a joyous movie but has deeply sad moments and is an absolute must see. For UK viewers get it on iPlayer before it’s too late. 20,000 days on Earth; a review. Nick Cave is a very special musician. In fact musician may be the wrong descriptor. He’s a very special writer that specialises in music. He has Warren Ellis and his many collaborators to dial up the music side of the equation. in this documentary, that looks like a movie, that, yes, he co-wrote, you find yourself immersed in the mind of a genius for an hour and a half as he discusses his life, his loves, his inspirations and his deep internal psychology in something approaching forensic detail. He is a very beautiful man. He talks painfully honestly at times about everything that is true to him. His ‘muse’ – his wife Susie who lies, back turned to camera in bed with him as the film opens. We see half glimpses, stolen moments of her off and on through the film but little more. We see a photo of her projected on the wall of his archivist’s office. She is as beautiful as he is. Later, we see Cave guzzle pizza with their twin sons, arm around the shoulder of one of them, devoid of comment/emotion, almost voyeuristically. It also spells L.O.V.E. We see him kiss Warren Ellis full square on the lips as he visits his musical ‘muse’ on the occasion of a casual lunch of eels in black pasta. We see him in the recording studio. We see him crafting lyrics. We see him performing live. Now, this is the thing. 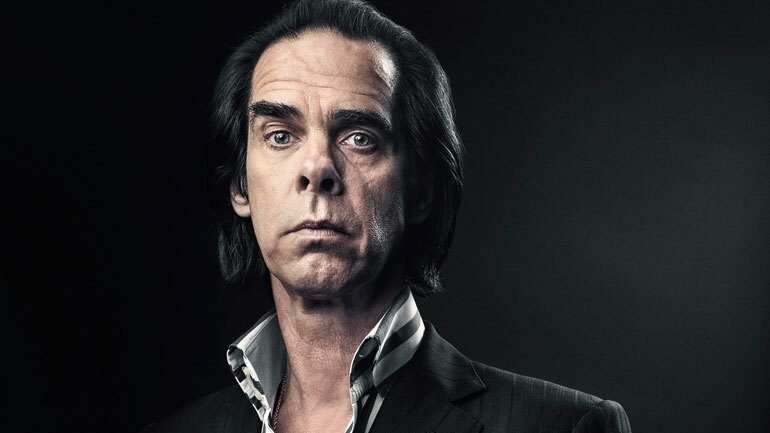 Anyone who has been to a Nick Cave and the Bad Seeds gig knows that no band on earth put in the same level of emotional comitment to their music; (perhaps with the exception of his faux-misogyny project Grinderman) Ellis all crazy violin fury, Cave all emotional connection. It’s this latter point that made the movie for me. He talks about how he ensnares individual audience members and then demonstrates it with a live performance of Higgs Boson Blues that reduced his female ‘victim’ to tears. Me too. It was all too much. All too emotionally engrossing. And then there’s the craft…the soundtrack (obviously) the direction and the cinematography are all sublime. A special shout has to go for Editor Jonathan Amos. And the cameos; Kylie, Ray Winstone and Blixa Bargeld. I’m left with a tantalising question. Is this the greatest film ever made about music? I think it has claims on that. Notwithstanding School of Rock. The recent past has been the most enlightening time of my life. It’s been like a second adolescence; enlightening because it has taught me an entire new language and has forced me to decide what is most important to me in a democracy; a second adolescence because it’s as if I have escaped childhood and been forced to understand what the impact of big grown up things might mean for the rest of my, and my family’s, life. I don’t consider myself politically knowledgeable; sure I can spout left wing or right wing bluster same as most of us, but until now it has been no more than that. I’m a political minestrone: I like a bit of left wing this, some centrist that and quite a lot of right wing garnish too. Maybe that’s why I’ve considered myself a Liberal for most of my voting life. But the Scottish Independence Referendum has no room for minestrone. It’s in. Or it’s out. I’ve said for a long time now that the Independence vote is not a political decision, many passionate Scottish writers say this too. It’s a decision about self determination; not a political commitment. But that’s not true. Is it.? How can it be in the current UK political paradigm that is so sick, so indulgent, so misguided; in so many ways? Yes, the outcome will be self-determination for Scots and the main benefit will be self-determination and the ability to make our own decisions for ever more; good or bad as they may be. But the decision-making crux, for me, has nevertheless been very, very political. I was never a Nationalist, and certainly not a Separatist, when I was younger. I was proud to call myself British (indeed my mother called it crass to write ‘Scottish’ in the box on a form that asked your nationality). I was too young to vote in the 1979 referendum – I was still an adolescent – but had I been able, peer pressure would no doubt have pushed me into voting a resounding No! But 1979 was a very different time. In 1979 Labour was left wing and Conservative was on the cusp of Thatcherism. The UK was about to change forever and that, fundamentally, is why I am voting Yes on Thursday – because the resultant and consequent change has become intolerable. In some ways we can look back on Thatcherism as a unique period in our times. David Peace captures it magnificently in his miner’s strike novel, 1984, with stunning venom. But it’s not. Today we are mired in Thatcherite legacy like nobody could ever have imagined. We now live in a neo-liberal state that appals me. In the great chess game that is British politics every move has to be anticipated and countered. Pre-Thatcher the game wasn’t chess it was draughts. Black versus white, right versus wrong. Only one direction of travel and an opposing one at almost every move. Now, however, the battle lines have become so confused it’s as if there is no overall goal. No black and white. 50 shades of grey. Politics is no longer about winning, it’s about taking part. Staying in the game. And that blurring of distinction, in which Liberal and Labour alike have had to secede principle in search of staying in the game has resulted, firstly, in New Labour in 1994 and secondly a Con/Lib coalition in 2010. Where next? I shudder to think. The two main opposition parties have become pale imitations of the enemy they despise. And the result is a neo-liberal blancmange that Westminster simply cannot escape. Give me minestrone over blancmange any day. As part of my decision making process I read Stephen Maxwell’s excellent Arguing for Independence: Evidence, Risks and Wicked Issues, the absurdly unwise Scottish Government manifesto White Paper, Unstated: Writers on Scottish Independence (superb), Wings Over Scotland, many, many blog posts including two in particular that stood out; Bella Caledonia and Business For Scotland. Whilst these undoubtedly had a nationalist bias most were backed by credible sources and most acknowledged the inherent risks of separatism. I also had the great privilege of attending hustings and debates with all sides of the debate represented. I went out of my way to take in the Orange Order’s Grand March through Edinburgh and enjoyed a soupcon of Trotskyism in the form of Tommy Sheridan’s brilliant Hope over Fear tour. So I consider my decision reasonably well informed. Of course we’ve had the official campaigns to ponder over too. The Yes campaign has been positive and enjoyable (if light on facts) and the No campaign a horseradish bitter tirade of disingenuity and hopeless rhetoric. I come back then, on the eve of voting, to what has swayed my decision. Certainly it was not the official campaigns; either of them. Nor my reading, although that helped inform me. No, what did it for me was under the bluster, the ridiculous rhetoric and the lampooning of Westminster that made up Tommy Sheridan’s sometimes pantomime posturing lay a truth that I cannot avoid. A truth that will probably cost me money as I look left, not right. But then, a principle’s not a principle until it costs you money I was told. What Tommy Sheridan laid bare for me was the hopelessness that neo-Liberal governance is creating. No-one benefits from this. Least of all the under-privileged. In an independent Scotland I look forward to a political landscape (left wing dominated but with a vocal and electable right) that rids us of neo-liberal posturing; that opens the door of the debating chamber to well argued and intensely held beliefs, that socialism and conservatism both have good things to offer, that liberalism steers a course through the middle and that the decisions that come out of that chamber are argued with focus and relevance to the people that live within its range. The people of an independent Scotland. I’m sorry I have bombarded you with months of social media postings. But that’s what the un-friend button is for my friends.